As the Church states Mary is an mediator between a man and God, and she is the advocate before the God for those who pray to her.
" Her assumption into heaven does not mean that she has laid aside her salvific role; she continues to obtain by her constant intercession the graces we need for eternal salvation. . . . That is why the Blessed Virgin is invoked in the Church under the titles of Advocate, Auxiliatrix, Helper, Mediatrix." THE SECOND VATICAN COUNCIL, 1964. And what does the Holy Bible says about who the mediator, advocate, and helper is? “For there is one God, and one mediator between God and men, the man Christ Jesus” (1Тim.2:5). “And if any man sin, we have an advocate with the Father, Jesus Christ the righteous”: (1John.2:1). “The Lord is my helper”. (Heb.13:6). The Bible tells: “Salvation is of the LORD” ( Jonah 2:9). Jesus said: “no man cometh unto the Father, but by Me”. (John.14:6). “there is none other name under heaven given among men, whereby we must be saved”. (Acts.4:12). 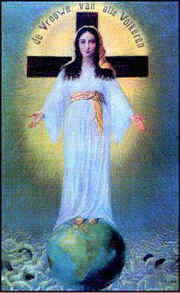 Look at these pictures, taken from Catholic websites. 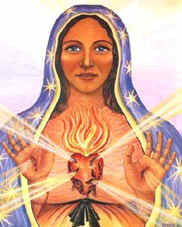 Here is represented not just Mary, but Mary Christ. You see the cross behind her back, as though she only just has left it, you see the hands, punched by nails... Satan passionately wishes to withdraw the people from the True Savior having forced them to believe in another Savior, in another god, or... the goddess. It's not Мary who died for our sins –It’s Jesus. The Catholics should accept advice given by real Mary: “His mother saith unto the servants, Whatsoever he saith unto you, do it” (John. 2:5). 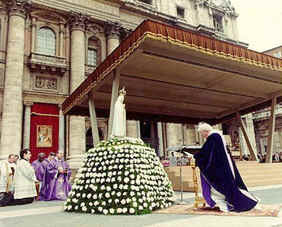 In this photo made in May, 2000, Pope John Paul II prays before the statue of Maria. On the other picture –the pope and archbishops do the same. It is idolatry. Paul persuaded “not to keep company, if any man that is called a brother be … an idolater”. (1Cor.5:11); .”Wherefore, my dearly beloved, flee from idolatry”. (1Cor.10:14).